BRIDES-TO-BE PLACED ENTERTAINMENT 9TH IN PRIORITY BEFORE THEIR WEDDING! 75% OF BRIDES PLACED ENTERTAINMENT 1ST OR 2ND WHEN POLLED AFTER THEIR WEDDING DAY! 84% OF BRIDES THAT CHOSE A BAND REGRETTED THE DECISION AND WISHED THEY HAD CHOSEN A DJ! 95% OF BRIDES POLLED AFTER THEIR RECEPTION REGRETTED CHOOSING A BUDGET DJ OR FAMILY FRIEND TO HOST THEIR RECEPTION AND WISHED THEY HAD GONE WITH AN EXPERIENCED, ESTABLISHED PROFESSIONAL!!! Only the Top DJ Entertainers/Master of Ceremonies in the business! Only the finest cutting edge sound systems, video equipment, lighting & special effects available! The largest & most comprehensive legal audio & video libraries on the planet! Six, count them 6, completely different Wedding Packages to choose from, some of which nobody has! Numerous Wedding Options, most of which nobody has, to augment our already phenomenal stand alone Wedding Packages! A fresh, original, creative approach to traditional Wedding customs & activities always included in our Trademark performance! 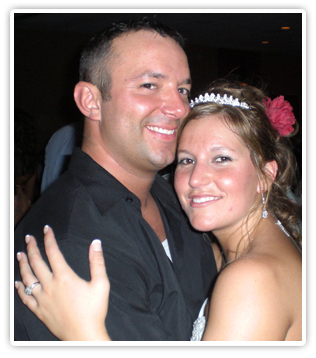 We specialize in Weddings and are proud of the thousands of happy brides and grooms we have served. We are also very grateful to many of those couples for the numerous referrals they have sent our way. Our packages are designed to fit your budget, adjust to the number of guests attending your reception, and, for the discriminating shopper, provide the extras that will make your reception nothing short of spectacular! You will not find a better value for your money or a more professional outfit to entertain at your reception...anywhere...guaranteed! All packages include a classy master of ceremonies style Disc Jockey, access to our 1,000,000 plus song CD library, state of the art sound system, a light system, cordless microphone for toasts, prayers, etc..and a customized wedding outline and music menu. Your individual taste and preferences will be thoughtfully addressed as customization is the trademark of our preparation! The Essentials Package...Basic sound, cordless mic for toasts, prayer, etc., and access to our huge CD library and a Professional Wedding MC/DJ! 50 to 125 guests. Perfect for those on a strict budget! Call for detailed information and pricing! The Deluxe Package....Designed for Wedding Receptions of 75 to 150 Guests. It includes an Excellent sound system, a cordless mic, access to our huge CD library, a Professional Wedding MC/DJ and a custom, personalized wedding outline! The Deluxe PLUS Package....Our most popular smaller wedding package...you receive an excellent sound system (your choice of 2 different sized speakers), beautiful dance lighting (one light tree), 4 uplights for the head table, access to our 1,000,000 song CD library, a Professional Wedding MC/DJ and a comprehensive, personalized wedding outline. For 75 to 150 guests! The Monster Package...Awesome sound, access to our 1,000,000 song CD library, a professional wedding MC/DJ and a comprehensive personalized wedding outline. For 150 to 400+ guests! The Monster PLUS Package...Our most popular Wedding Package period! 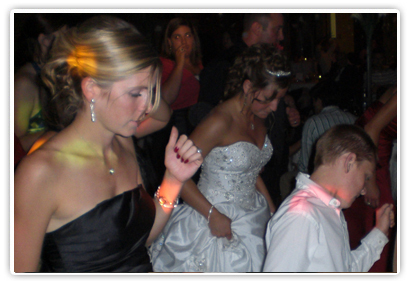 You receive awesome sound, spectacular dance lighting (2 light trees), 4 up-lights for the head table, access to our 1,000,000 song CD library, a professional wedding MC/DJ and a comprehensive, personalized wedding outline! For 150 to 400+ guests! The Ultimate Jam Package...Simply the most prolific mobile VJ/DJ program ever created! It includes awesome sound, spectacular lighting (2 light trees), 2 video screens, a TV camera for live coverage as well as the videos, 4 up-lights behind the head table, a 100,000 song VIDEO library, access to our 1,000,000 song CD library, Deric Langton hosting and performing the program and a comprehensive, personalized wedding outline. Cutting edge, even futuristic, NO ONE can touch this program. This is definitely for those couples looking for a "knock out" presentation. We are constantly upgrading and perfecting this phenomenally successful package! Recommended for receptions of 150 to 400+ guests. Recommended for Receptions of 150 or more! WE FILL UP FAST ! DON'T WASTE ANOTHER MINUTE !